Don’t know about you, but where I come from, the groom is saddled with the honeymoon. The bride gets to worry about just about everything else, but the honeymoon is up to him. This is your moment, so to speak, to prove yourself. 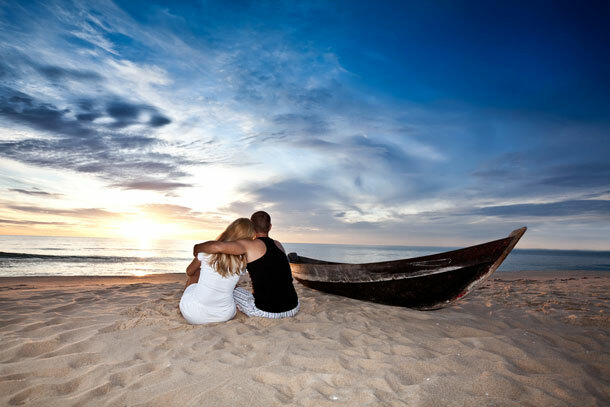 And it really isn’t difficult as the honeymoon is essentially the couple’s ‘down time’ where they can spend a few days solely in one another’s company before returning to life as married people. Blow your trumpet – wherever you book your accommodation, make sure that they know it’s your honeymoon. This can make all the difference to the treatment the two of you receive. Some hotels offer specials for honeymoon couples, like champagne on arrival, whilst others have special dedicated suites or rooms or even special rates. Go the extra mile – arrange to have champagne in the room on arrival (if the accommodation doesn’t do so), flowers and even special gifts during the course of your stay, like chocolates, an item of clothing, bath salts… the difference this will make to your bride is worth the extra effort (I can’t emphasise this enough). My husband organised to have a breakfast basket delivered to our B&B and the fridge stocked with certain foods, so that we didn’t have to think about meals for the first day on honeymoon. Be smart – if you’ve left things for the last minute, and haven’t organised a list of things to do at your destination, book your bride into a local spa for a morning session whilst you take care of things like buying flowers and finding out which sights are the best for both of you to visit. Plan special moments – if you know the view from a certain hill at sunset is going to set her heart aflutter, or a moonlight walk on the beach, plan your day so that this is on the schedule. Give her full attention – tempting as it may be to take calls of congratulations, or check in on work, this is your honeymoon. Switch the phone off.